My name is Meir. You may have seen my name on the internet, probably in relation to my activities as a writer and publisher of business guides. This is just one side of me, the visible one. There has been another side to my online presence, a concealed one. And there is where I've been taking advantage of the Amazing Formula to accumulate my seven figures fortune. Now look, 99% of the folks who try to make it in Internet marketing follow the same rout, the same set of activities. They all move in one big herd. Listen, In the highly competitive online marketing arena, when you do the same as anyone else you don't stand a chance to succeed - you are doomed. In order to win the internet marketing battles you must go off the beaten path, you need to do something different, you need a competitive edge - and that is where the Amazing Formula comes into play. It gives you that "unfair advantage" to boost your sales, pile up profits and leave your competitors in the dust. 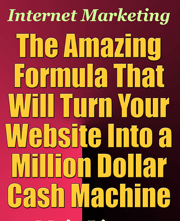 While you are reading this hundreds of people on the Internet are making money like crazy with the formula. Why not you? It doesn't require "brains" or education, anyone can do it! As a matter of fact I know of a high school dropout that is making tons of money with the formula. Are you ready to make money now? just click on the "Buy" button above!